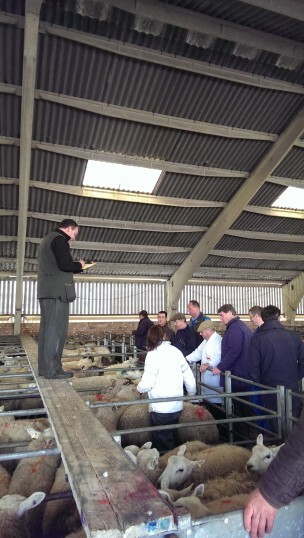 Sheep auction being led by Tim Brassington. Auctioneer Tim Brassington leading the sale of the sheep. The third of three recordings (the others are of sorting sheep here and cattle here). Once the sheep were in the pens, the auctioneer Tim Brassington led the sale with a very distinctive auctioning style. It was very hard for me to follow, and I couldn’t see any signals that the buyers (there were three or four, I think) were giving to indicate they wanted to increase their bid, which were in pounds per kilo. Everything worked like a well oiled machine, and each lot was sold quickly, with Tim walking on scaffold planks above the pens. A lady followed and marked each sheep as it was sold with a mark to identify who had bought it. Throughout my visit to Stanfords several people made wisecracks about the windshield on my microphone, one of which you can hear here.